Nha Trang is a coastal city in central Vietnam. In Nha Trang shore excursions from cruise ships, you can enjoy the temperate climate and convenient transportation. The city is also the center of politics, commerce, culture and tourism in the Khanh Hoa province. 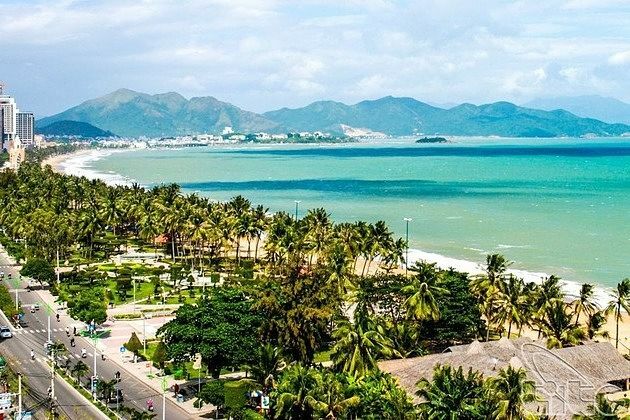 With favorable natural conditions in terms of location, landscape, and climate, along with a rich culture, Nha Trang is one of the most famous tourist destinations in Vietnam. The best time to visit Nha Trang is in the summer when the weather is warm and sunny with a beautiful blue clear sea. The rainy season in Nha Trang runs from October to December when the weather is cold with heavy rain. From January to April, the weather is quite cool which is nice for Nha Trang cruise excursions. Nha Trang is famous for its white sand beaches, offshore islands with magical coral ecosystems, Chong Island, Doc Let Island, the ancient Cham temples, and Long Son Pagoda… We offer the best Nha Trang shore excursions for cruise ship passengers from Cau Da port, Nha Trang. Please contact us to get the best day trips or tailor-make a unique Nha Trang day tour. We will absolutely show you the best Nha Trang shore excursion ever! I hear that there are the paddle-rickshaws in Nha Trang. Is this worth for me to take for my shore trip in Nha Trang for 8 hours? Using paddle-rickshaws (called Xich Lo (cyclo) in Vietnamese) is a good way to explore Nha Trang on your short shore excursion. 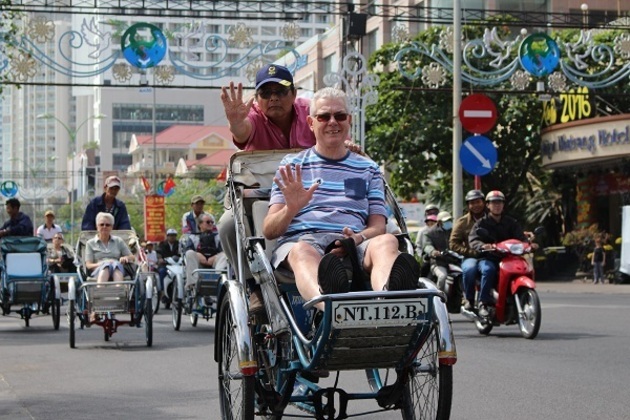 That sort of vehicle is referred to as the ‘King of the Road’; the cyclo ride is always an experience not to be missed when you visit Nha Trang or Hanoi. The trip around some highlight of the city on the paddle rickshaw takes you for 2 to 3 hours. What should I visit during the short excursion in Nha Trang? The cruise ship offers many excursions but I want to do something by my own with some friends. What do you suggest? We have many shore excursions programs for you to choose. All of those will be private trips. The more people the cheaper. 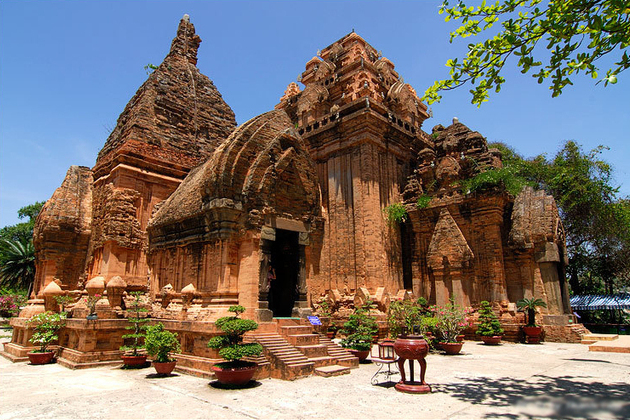 Those are the must-see places in Nha Trang: Po Nagar Cham Towers, Long Son Pagoda, Dam market, the Museum of Oceanography… You can take a boat trip on Cai River or visit the countryside area near by Nha Trang. One more place you should not be missed is the Da Lat Su Quan, the workshop offers the best embroidery art works from Vietnam. Can I get come discount for my trip if I have a group of more than 10 people join on your shore excursions? Yes, you can, the more people, the cheaper the excursions will be. We will send you some offers over your email, please check. I heard that on the trip we will visit pagoda, do i need to dress up appropriate for that? You should we comfortable clothes for your trip, we suggest long pan, T-shirt, in some cases if you have a big scarf it will help a lot as you need to cover your shoulder and feet when visiting inside the pagoda. What can I buy during my excursion for souvenir in Nha Trang? What do I expect to see in my excursion in Nha Trang on Cai River bat trip? 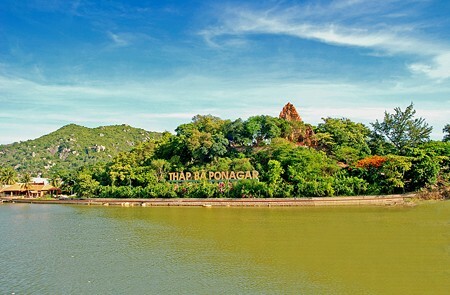 You will see the city of Nha Trang a bit and you can visit Po Nagar Cham Tower, you can see a lot of activities of the farmers planting their vegetable crops, you also visit local house and enjoy the scenic view on both sides of the river before disembarking and returning to the ship. 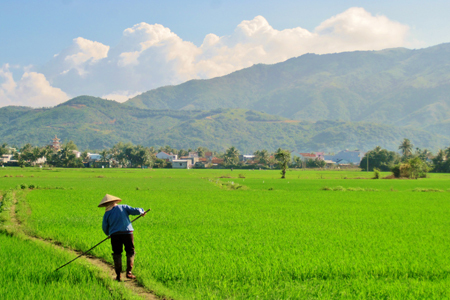 What to see in the countryside and River trip in Nha Trang? Thanks for your request on Nha Trang shore excursion, we have dropped you the detailed information with the note and tips in case of rainy weather in this area, please check your email. Please can you send prices for 2 people for this trip. We will be arriving on Diamond Princess on Sunday 9th April. Thank you for reaching to us. Please check your email for detailed quotation of this Nha Trang Cultural shore trip. Feel free to ask us any question you may have. My wife and I are arriving on the cruise ship Diamond Princess on 26/11/2017 from 0900 – 1700. We are interested in either joining a small tour group or an exclusive tour. We are interested in local culture, cooking classes, river cruises. What is on offer that day. Thank you for your request. You can have a look at our available tours on the website, or tailor-make a private tour. Please check your email for more details on Nha Trang shore excursions. What is the cost of the tours you offer in Nha Trang and Ho Chi Minh? The price per pax is cheaper if there are more people joining the tour. Please check your email for detailed quotation. Kindly let me know if you need more information. HI, I am looking for a private tour for my wife and I. We like this itinerary but also want to include the Po Nagar Cham Towers. Is it possible to book this itinerary but also include seeing the towers? If so, what is the cost? Thanks for your comment on Nha Trang shore excursions. Please check your email for the detailed itinerary and quotation. Hi! My husband and I will be visiting Nha Trang on Jan 29, 2020 on a cruise ship stop. We would like to see the Cham Ruins, the local market, see the local landscape, and possibly a hot spring or a mud bath. I may be able to recruit more passengers to join us. Would you be able to accommodate us? Thank you. We just created the detailed itinerary of Nha Trang shore excursions with your picked destinations. Please check your email, and freely ask us any other question. Being well known for its beaches and scuba diving, Nha Trang is widely considered as one of the world’s most beautiful bay. Nha Trang’s economy relies largely on tourism which makes this city is definitely a friendly city for tourists especially international visitors. Tourists will want to lengthen and lengthen their Nha Trang shore excursions as long as possible because of a wide range of activities and attractions with mild temperatures all year round. Crystal beaches with fine and clean sand; several with amusement and water parks in the city and on islands off the coast; various islands with their own unique features; a variety of activities such as island hopping, scuba diving and water sports or the fresh delicious local cuisine which of them make you want to try first? Of course, you are free to try them all if you have enough time. So, there is no reason while you go to the Vietnam shore excursions and do not stop in this beautiful beaches of this city. Before you decide whether Nha Trang will be one of your destinations for your shore excursions or not, a list of things-to-do-and-see in Nha Trang is listed below as the reference for tourists’ final decision. Vietnamese are free to choose whatever religions they want to follow, so it is totally normal when there are various religions in a small region. There is no way easier for tourists to understand thoroughly what religions the local people are following except go directly to those destinations. Various places for different religions are highly recommended such as Ponagar Temple, Long Son Pagoda, Nha Trang Cathedral and so on. It will be very interesting if you spend all day long to visit all those destinations. Imagine you are delving yourself into a Christian atmosphere in Nha Trang Cathedral, for example, a few minutes later, you can immediately immerse yourself in Buddhism culture! All these cultural spots are normally very cheap or even free for the entrance fee, the only things that international tourists have to notice are the clothes. If you wear irregular clothing like shorts, you will be not allowed to enter the ceremony areas of the Nha Trang Cathedral, for example, some places such as Long Son Pagoda, however, will let you borrow long robes to put over their clothes before going in the worship places. By the way, tourists should wear polite clothes when coming to these religious destinations as a way of showing your respect for other cultures. 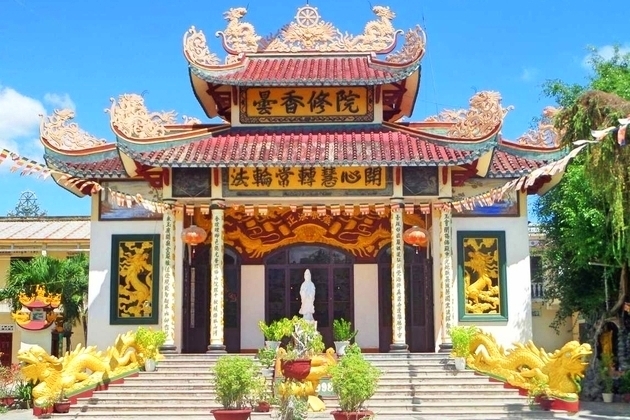 You have to go such a long way to this religious city, there is no reason for not explore every single religion in Nha Trang to color your Nha Trang shore excursions from Cau Da port. Besides being famous for various extraordinary beaches, Nha Trang also has a wide range of mud baths and hot springs for tourists to relax. They are such the perfect choices especially for those who get used to with the crystal clear water after a long time traveling in the cruise ship and want to indulge themselves after a long day of the tour. So the Thap Ba hot springs center is definitely their heaven. You have everything you need in this heaven, from normal things such as swimming pool to amazing things like mud-baths, herbal-bath, Jacuzzi, waterfall and sauna. When coming here, you can not only rejuvenate but also get benefits from these natural hot mineral springs and mineral mud like remove dead skin cells, supply minerals to the body or soothe fatigued muscles. What a wonderful deal! 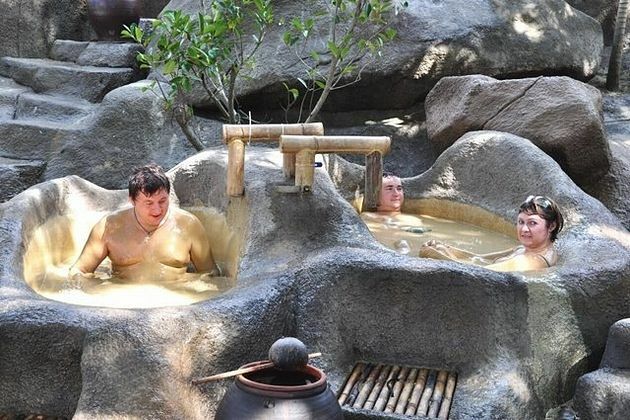 This hot spring center is located behind the Po Nagar Cham Towers, so you can think about visiting this destination also on your Nha Trang day trips from Cau Da port. Besides visiting all the famous attractions to explore the beauty of a region, you also want to discover the lifestyle of these local people to find out the differences between you and them. So a day trip to the outskirt of Nha Trang is definitely what you need in your Nha Trang shore excursions. After the cruise ship berths at the Cau Da port, you can start your Nha Trang on-land day tours. Go for a walk, ride a bike or simply go by car are some ways for you to travel to this countryside. 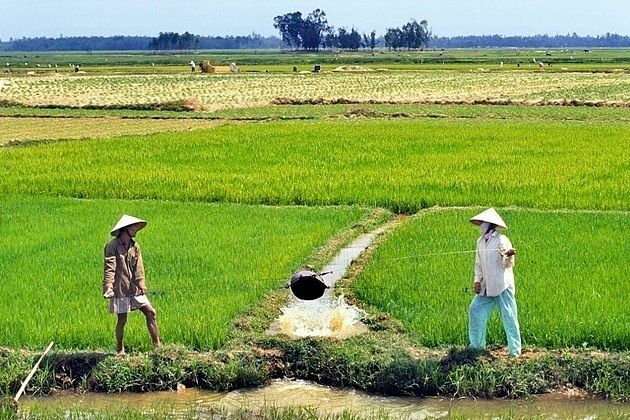 You can see how the hard-working farmers work on the endless field, discover some ancient pagodas that even the local people do not know its origins or an old small school where lovely students are studying from the Vietnamese alphabet. Your Nha Trang shore excursions will not only a vacation to relax but it is also a chance for you to travel forms a young man – the more you go, the more you know. 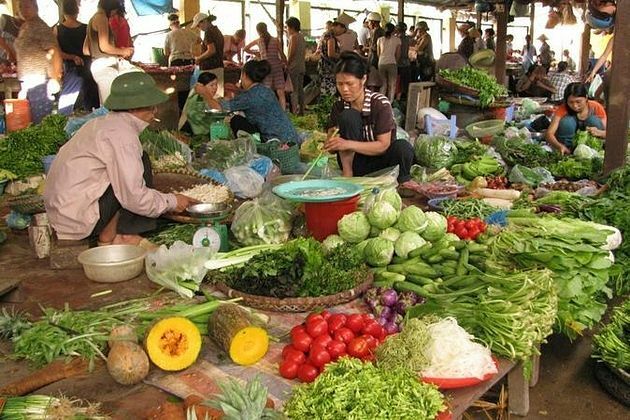 The local markets in Nha Trang will definitely please your passion for shopping from necessary things in daily life to souvenirs, food, fruits with a very cheap price. Just go for a walk around the markets and you will find out that your basket is heavier while your wallet is lighter because of a variety of products. Dam market (Cho Dam) is the most attractive one for tourists because it is the largest one with the most famous local specialties of Nha Trang – dried seafood section as well as various seasonal fruits in the tropical climate. Attracting various foreigners make the price in here is a litter bit higher than other markets which can become your challenges to improve your bargaining skills. A representation for a different style of the market from Cho Dam is Vinh Hai market. This market is smaller and not a tourist market which will offer you the real authentic stuff, for a much cheaper price and you do not need to worry about fake branded items. Those are some markets are suggested, tourists can simply go to the nearest local markets to explore them. You can consider about riding by cyclo – the three-wheel bicycle for a ride to visit all the markets to find out which one is your favorite. Or if you know what markets you like most, you can tailor-make your own Nha Trang shore excursions from Cau Da port to make it easy for you to go there to take time. 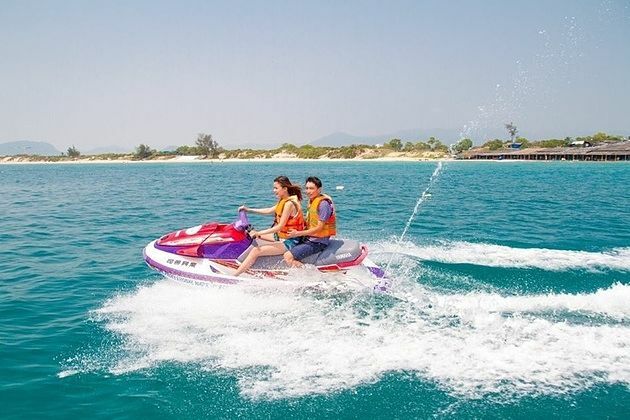 Visit various destinations to let you know the majesty of nature, dig yourself into the crystal water or hot springs or mud baths to help you relax after a long day, but if you want to have fun and color your summer, do not miss various outdoor activities in your Nha Trang shore excursions from Cau Da port. Watersports, scuba diving or snorkeling and many more activities will surprise you. Just have activities you cannot think about, do not have activities you cannot find in this beautiful city. Scuba diving is highly recommended because this is a wonderful chance for tourists to dive into vast expanses of beautiful reef under the Hon Mun Marine Protected Area and explore diverse colorful marine life such as seahorses or frogfish. Even though the water is quite shallow make it become an excellent location especially for beginners to learn diving, a good dive guide is suggested for your safety as well as to save your times in finding the best areas for macro life.